Warnings that time and again as a child I would ignore, yet as an adult, it’s a concept that I seldom associate with modern horror. Over the course of my film-watching life, I have viewed countless horror films that have disturbed me, shocked me, and even left me at a loss for words. But I’m rarely left physically scared or wake me up in the middle of the night. That is until director Ari Aster’s Hereditary, which is the first horror film of my adult life that frightened me to the point of sleeplessness. Hereditary is a story of profound loss and the lengths broken people are willing to go to remedy their profound grief. After the death of her mother, Annie Graham (played by Tony Collette) and her family attempt to find some sense of normalcy. It immediately becomes apparent that the Graham family is a powder keg of emotionally distraught and damaged individuals. Annie’s relationship with her mother was strained to say the least and has resulted in making the family unsure of how to properly grieve. There is also the very secretive nature of her mother, evidenced when complete strangers attend her funeral and randomly approach Annie in public. The family is then struck by another sudden loss that sends them into a spiral of shocking discoveries and truths they are wholly unprepared for. The realistic and relatable family drama draws the audience in, but they are utterly unprepared for the bizarre and gruesome twists and turns the film will take. This family drama is entirely thanks to Toni Collette’s performance, which is just phenomenal, and possibly her best to date. Her portrayal of a grieving mother, whose descent into madness is as palpable as it is nerve-wracking, is of a caliber seldom rivaled in modern horror. Collette’s ability to unnerve and build nearly unbearable tension through minuscule or seemingly inconsequential actions or dialogue is the driving force behind the constant sensory bombardment that Aster has crafted. It’s cliched to say, but going into Hereditary knowing as little as possible is the ideal way to see it. Just know that you are utterly unprepared for what unfolds over the course of its two hours and seven minutes run time. Director Ari Aster spends a great deal of the first half of the film crafting tense and anxiety-riddled scenes that prioritize analyzing character relationships over scares. Those who are looking to be inundated with jump scares will undoubtedly be disappointed. I was initially perturbed by not being remotely scared by the first 45 minutes of the film, given the vast amount of press hype touting Hereditary as terrifying. Be patient and know that Aster is building towards something shockingly frightening. Historically, horror films have struggled to retain their ability to scare by the third act, as the monster or antagonist has often been unveiled by this point in the film. 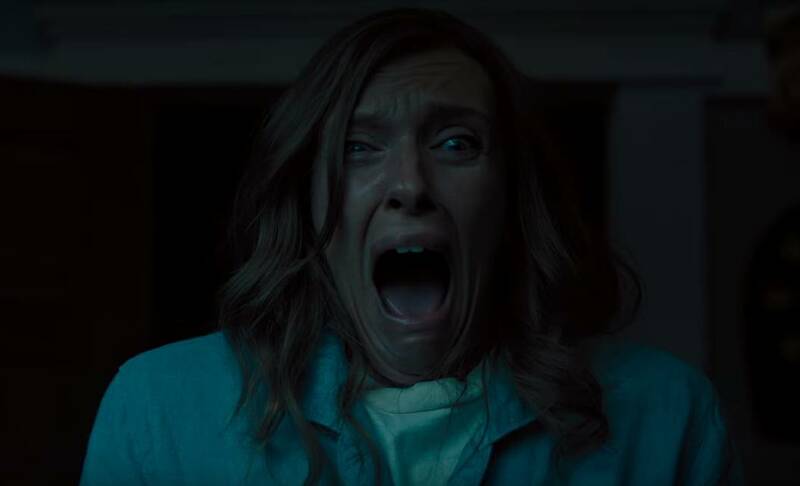 Hereditary is constructed in the reverse order of traditional horror, as the first two acts are suspenseful to an anxiety-riddled degree, as the viewer is practically holding their breath by the end waiting for the scares to arrive. The careful examination of the family dynamic and their inability to address the underlying issues forcing them apart are imperative in crafting an atmosphere that makes the scares hit as hard as they do. The last 30 minutes of the film are the terrifying culmination of Aster’s suspense building, which feels explosive and the bombardment left me emotionally drained (and caused a woman at my screening to scream uncontrollably). Some of what sells the scares are that they aren’t gratuitously gory. Nor does Aster over-utilize jump scares, which keeps them effective when they do occur. The construction of the film is what sells this sense of terror and dread, with masterful edge of your seat waiting and it’s this anticipation that heightens the terror that eventually unfolds on screen. Much of the praise given to Hereditary has focused on its scares, and while it is well deserving of this, many have failed to address the film’s masterful construction. Despite being 10-15 minutes too long, the pacing is nearly perfect. The realistic introspective exploration of a seemingly strained, but average family casts a spell of calm over the audience, which left me entirely unprepared for the film’s terrifying third act. Not only visually shocking but processing the emotional baggage these characters undertake is so profoundly disturbing that I couldn’t shake this film long after I’d left the theater. A monumental achievement for Ari Aster’s directorial debut and displays his ability to craft palpable tension with a terrifying emotional and visual tale. Ari Aster's horror directorial debut is a masterclass in crafting unbearable tension and suspense that lay the foundation for terrifying conclusion audiences aren't soon to forget.